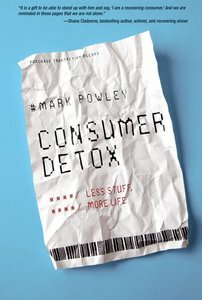 In this book, Mark Powley shows how consumerism contradicts the life and teachings of Jesus and gives you advice on how to break out of consumerist culture to embrace a deeper and more generous life. Follow along in a three-part deconstruction of today's full-throttle existence to build the kind of life that Jesus modeled. - Publisher Consumerism is everywhere. It shapes the way we eat, shop, rest, think, love and believe. We can't escape it, but how can we live well in the midst of it? We are daily seduced by a 250 billion dollar marketing machine. But how often do we consider how this might influence us? The current prevailing orthodoxy is that life should be lived to the max. By contrast, Jesus modeled a life of joyful limitation -- free to do; free not to do. Consumer Detox, complete with the Detox Diary in the back of the book with suggestions for each chapter, encouraging stories, and space for writing personal reflections, is for those who want to break out of a lifestyle dominated by consumerism and journey toward a richer, simpler, more generous life. Consumer Detox, written out of Mark Powley's experience of making a change in his own life, is a three part book that will help you break out of the consumer mindset, slow down to enjoy the natural rhythms of life, and live a life of generosity. This book isn't about living a smaller life but having a bigger vision, which can help you become everything you were made to be. Consumerism is everywhere. It shapes the way we eat, shop, rest, think, love and believe. We can't escape it, but how can we live well in the midst of it? We are daily seduced by a 250 billion dollar marketing machine. But how often do we consider how this might influence us? The current prevailing orthodoxy is that life should be lived to the max. By contrast, Jesus modeled a life of joyful limitation -- free to do; free not to do. Consumer Detox, complete with the Detox Diary in the back of the book with suggestions for each chapter, encouraging stories, and space for writing personal reflections, is for those who want to break out of a lifestyle dominated by consumerism and journey toward a richer, simpler, more generous life. Consumer Detox, written out of Mark Powley's experience of making a change in his own life, is a three part book that will help you break out of the consumer mindset, slow down to enjoy the natural rhythms of life, and live a life of generosity. This book isn't about living a smaller life but having a bigger vision, which can help you become everything you were made to be. Mark Powley is an associate pastor and has spoken and written articles on topics of interest to the emergent generation. He has a BA from the University of Nottingham and a Certificate for Theology Graduates from the University of Oxford. He lives with his wife and three sons in Hammersmith, UK.